So which is it: TheatER or TheatRE? (Or Theat-AH?) I've always been a fan of the "R-E" persuasion. Spellcheck is telling me it's wrong, but Spellcheck is also telling me that "Spellcheck" is wrong, so what a dummy. I love live theatre. I grew up performing, got my ever-so-useful B.A. in it, and saw tons of shows on the Great White Way while living up in NYC. So I'm practically an expert. I mean, I did play the Goose in a community theatre production of Charlotte's Webb when I was 11, but no big deal. Okay, so I'm not an expert, but I do love it immensely. Ever the emotional sucker, I cry tears of joy just about every time I am alive see live theatre. Now. 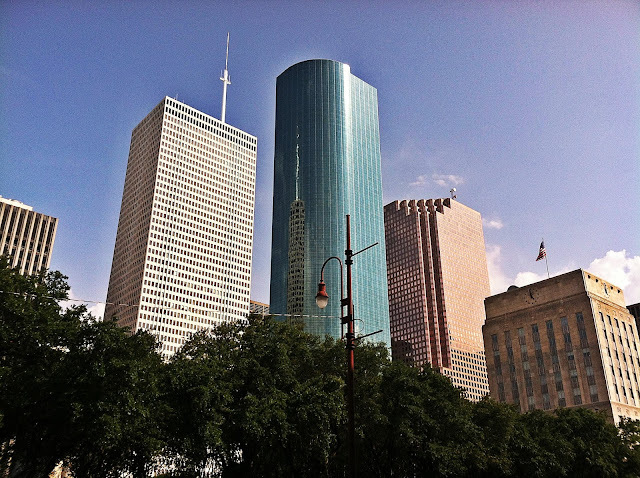 Having returned to Houston after living in culture- and theatre-soaked New York City for a gagillion years, I am happy to report that the caliber of Houston's Theatre district is right up there with the big, bad BroadWAY. 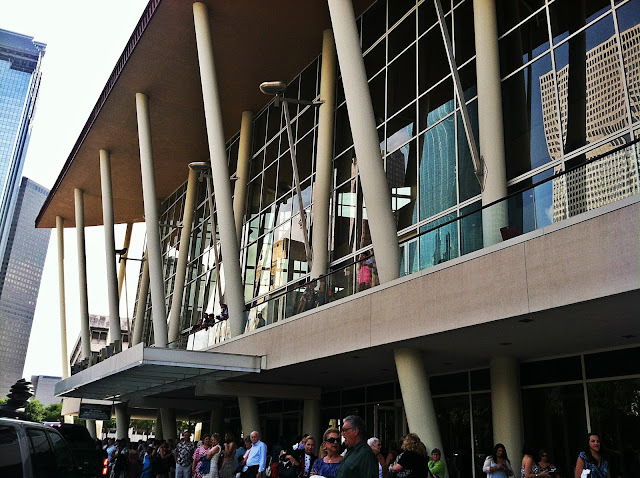 In the past few weeks, I've seen shows at the Hobby Center and the Alley Theatre, and they were wonderful. I was fortunate enough to stumble into a ticket to see Wicked at the Hobby Center with Jason's grandmother, Aunt Debbie, and their family friend. I've seen it before on Broadway, and this production was seriously just as good. The performers were all phenomenal, the musicians were amazing, and it was technically astounding. As Wicked should be. A great thing about the Hobby Center is they have the smaller Zilkha Hall for more intimate productions, as well as the massive Sarofim Hall for behemoths such as the Broadway tours. Two weekends ago I saw The Hollow by Agatha Christie at the Alley Theatre, which is the featured play for this season's "Summer Chills Series." This was the show Meredith and I almost missed due to our chaotic meal at Hearsay Lounge. But thank God we didn't miss it, because this "Whodunnit" was excellent. Again, great actors, great tech, great overall production. 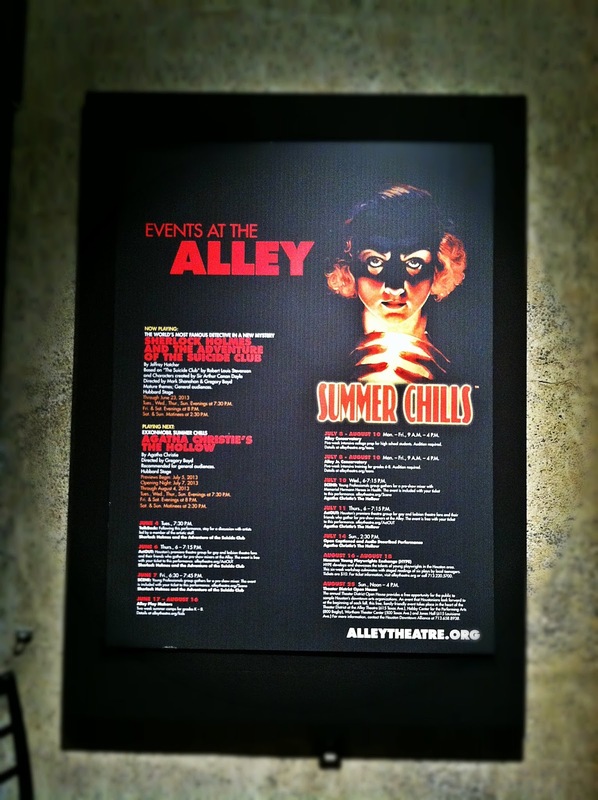 And I really love the Alley Theatre. There seriously isn't a bad seat in the house. Other great venues in Houston include the the Wortham Center, Miller Outdoor Theatre, and Jones Hall, to name a few. Because there are so many professional theatres here with top notch performances, I do not feel like I'm missing out on getting my fill of excellent live theatre. Plus, I'm a total sucker for that skyline.